Out of stock since Saturday, 21 October 2017. Due back soon. A complementary feed for sheep and calves designed to supplement iodine and selenium for up to six months. Each bolus supplies 3mg iodine and 0.6mg selenium per day, by slow rumen release for 5-6 months. 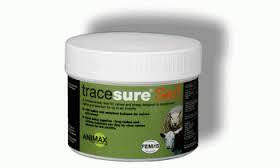 There are currently no questions for Animax Tracesure SE/I Bolus for Sheep & Calves - be the first to ask one!